Caesarean sections could be responsible for an increase of bigger babies that need the surgery because they do not fit their mother’s pelvis to be given birth naturally. A new study used a mathematical model to suggest that C-sections could be the cause behind the increased of disproportions between the fetus and the mother’s pelvis. In the 1960s, 30 in 1 thousand babies could not fit the birth canal. Today the number has risen to 36 in 1 thousand. Scientists still consider an evolutionary mystery why humans have not evolved to reduce the risk of obstructed labor. A new study has tried to understand why nowadays babies are bigger, which means that people instead of changing their anatomy to avoid complications at birth, they are doing the contrary. The only reason for human childbirth difficulty is that the large fetus head and the fact that women’s pelvis have failed to evolve and become wider to let babies be born naturally. Before C-sections, the child and the mother would die if the fetus did not fit the birth canal. Genetic information would fail to pass the necessary information to evolve and formed wider pelvis to the next generation since the baby would die during labor. 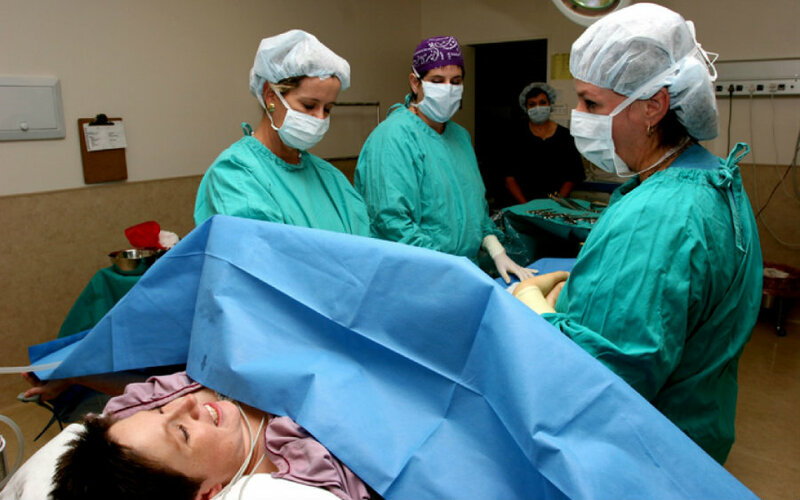 A new research made by an Austrian team discovered that risks of obstructed labor would continue to increase due to Caesarean sections. Dr. Philipp Mitteroecker of the department of theoretical biology at the University of Vienna and colleagues published their findings in the journal Proceedings of the National Academy of Science where they used a mathematical model for predicting C-sections consequences to human evolution. Dr. Mitteroecker argues that medical intervention has solved the problem of narrowed pelvis and bigger babies. Because moms now survive the birth, they pass on their genes encoding for a close pelvis to their daughters. According to the model, C-sections would increase fetopelvic disproportion although at a slow rate. The study used data from the World Health Organization and other large studies to predict possible evolutionary scenarios. They found that bigger babies are healthier than smaller babies, but at the same time, they increased obstructed labor risks. Bigger babies are more likely to survive childhood but at the same time make mother’s pelvis narrow since it might help their walking. A bigger baby also reduces the risk of premature births. Dr. Mitteroecker said the trend of smaller children has vanished due to Caesarean sections. The research estimated increase in the global rate of cases where babies are just too big to fit the birth canal, needing surgery to come to this world. Before C-sections, obstructed births represented 3 percent of births compared to what the model discovered: The rate has increased to 3.6 percent, which means a general increase between 10-20 percent. Dr. Mitteroecker stated that he thinks the trend will continue but it might not be a fast evolution, it would rather be slower than what the mathematical model showed. “There are limits to that. So I don’t expect that one day the majority of children will have to be born by [Caesarean] sections,” he added.